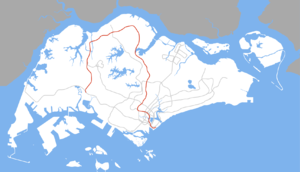 North South Line (NSL) is the first Mass Rapid Transit (MRT) line. Traveling from one end to the other takes about 65 minutes. The line is currently 45 km long with 27 stations, which includes Canberra station. 28 May 2017 Switching from Fixed Block Signaling system to Communication Based Train Control Signalling System. Full Jurong East ↔ Marina South Pier Withdrawal Trains will terminate at Jurong East Platform C.
SWT Jurong East → Yew Tee Operates during evening peak hours in the event of longer waiting times between Jurong East and Yew Tee. Special Ang Mo Kio → Pasir Ris Operates during morning peak hours in the event of longer waiting times along EWL. The rolling stock consists of Kawasaki Heavy Industries C151, Siemens C651, Kawasaki Heavy Industries & Nippon Sharyo C751B, Kawasaki Heavy Industries & CSR Qingdao Sifang C151A, Kawasaki Heavy Industries & CSR Qingdao Sifang C151B and Kawasaki Heavy Industries & CRRC Qingdao Sifang C151C trains. These trains operate from two depots along the line, Bishan Depot near Bishan station and Ulu Pandan Depot near Jurong East station. ↑ "New Platform At Jurong East Station To Open On 27 May". LTA (16 May 2011). Retrieved 22 November 2014. ↑ "SPEECH BY MR RAYMOND LIM,MINISTER FOR TRANSPORT, AT THE VISIT TO KIM CHUAN DEPOT, 25 JANUARY 2008, 9.00 AM". Government Media Release. Retrieved 25 January 2008.